Gambling is said to be as old as civilization itself. And given that some of the world’s earliest civilizations emerged in India, it’s hardly surprising that Indians love to gamble. With a flourishing economy, a growing, tech-savvy middle class, and a rapidly expanding internet network, gambling – and online gambling especially – is booming in India. Against that backdrop, you would imagine the Indian state would be keen to secure its slice of the proceeds. But yet, thanks to antiquated laws (some of which date back to colonial times), gambling – both land-based and online – remains largely unregulated in India. This lack of regulation makes estimating the size of India’s gambling market tricky. However, it is believed that the total market (including online and land-based gambling) is now in excess of $60 billion (source: 2up Group). Research conducted by Playwin (the lottery owned by the Indian state of Sikkim) in 2010 concluded that a fully regulated online gambling market in India would be worth $5 billion at current levels. 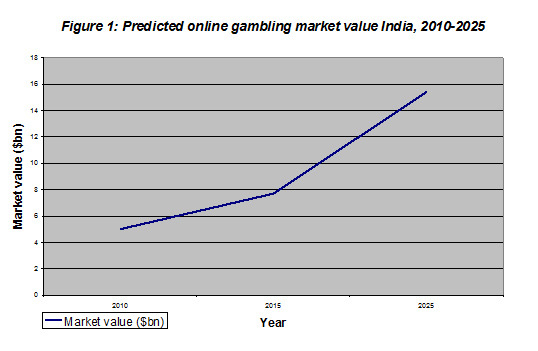 As online gambling is generally regarded as a middle class pursuit, the growth of India’s middle class should see this sector grow rapidly between now and 2025, as demonstrated in Figure 1 above. Increasingly in the West, online gambling regulation is being embraced. In countries such as Italy and Great Britain, online gambling is now regulated, creating new sources of tax revenue in the process. Other countries are now following suit. Tax regimes vary from country to country, focusing either on net or gross revenues. But by and large, the tax rates imposed vary from 15-30%. For India, such a tax system could be worth as much as $1.5 billion from the off. The purchasing of licenses by foreign operators would also result in further foreign investment in India, as under current laws, foreign operators would need to seek out Indian firms to partner with. India’s online gambling market’s growth is being driven by two factors: the growth of its middle class, and the spread of the internet in India. Both remain relatively small by the standards of developed nations, but are growing rapidly. Estimates vary, but India is believed to have passed the 100 million internet user mark in 2010 or 2011 (source: Internet World Stats), or slightly less than 10% of India’s population. Even compared to other newly industrialized countries, such as China (34.3%), this figure is low. And when compared to the likes of the USA (79%), Japan (80%), Germany (81.85%) and the United Kingdom (85%), it’s clear that the internet still has a long way to go in India. But things are changing fast. And by 2015, it is expected that this number will rise to 300 million (source: Times of India). Additionally, use of internet cafes is shrinking, meaning more people are using private connections, or their office networks, to access the internet. 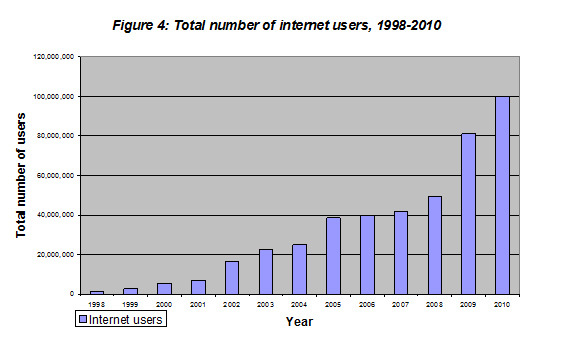 This rapid online growth has been mirrored by the ongoing growth of India’s middle class. The middle class in itself is expected to grow dramatically over the coming years. By 2025, it is expected that 583 million Indians will be considered middle class, compared to just 50 million in 2007 (source: McKinsey Quarterly). However, this is just half the tale. As more Indians enter the middle class, so the middle class’ spending habits are expected to change. And over the coming 12 years, it’s expected that middle class Indians will start spending more on recreational activities – something online gambling is likely to benefit from. One of the hurdles preventing the regulation of online gambling is the status of gambling in India, which has been hotly contested for some time. Betting on a game of chance remains unregulated in India, due to legislation such as the 1867 Public Gambling Act. By contrast, betting on the outcome of a game of skill is considered legal. What is considered to be a game of chance and game of skill are somewhat skewed compared to other countries, however. Horse racing and rummy are considered games of skill, but other forms of sports betting and card games are not. Given the technological and social changes that have been sweeping through India, the relevance of such antiquated legislation must be questioned. Sikkim – a sign of things to come? Sikkim now has its own state-owned lottery, Playwin. Interested parties included Betfair, William Hill, Ladbrokes and 888, some of which were already accepting business from Indian customers before the process began (and continue to do so). Unfortunately, questions about whether Sikkim is has the legal right to issue such licenses has seen the process stall. Nevertheless, the attention it attracted – even from companies with existing Indian customer bases – demonstrates that the online gambling industry would welcome regulation of the Indian market. India misses out in other ways. A lack of online opportunities to gamble at home sees many gamblers heading off to such destinations as Macau and Singapore. 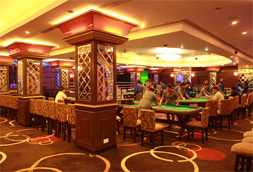 Fuelled by favorable visa terms and cheap airfares, these regional casino gambling hotspots are becoming more and more accessible to Indians. And their casinos are aggressively marketing themselves to Indians in turn. And the figures support this: according to the Macau Government Tourist Office (source: MGTO), almost 170,000 Indians visited Macau in 2010. This is a sizable increase on 2002, when a mere 5,000 Indians visited. And for those that do stay at home, the ability to gamble on unlicensed foreign websites ensures they too can enjoy gambling. As a result, much of this money leaves India. There are also social and economic benefits that India is forsaking by not regulating gambling, and online gambling especially. Regulation would create jobs, thus generating more tax income and taking pressure off social security budgets. 2008 research conducted in Ireland concluded that by 2020, regulated gambling could create as many as 13,000 jobs in a country with a population of 4.5 million (source: the Irish Times). Given the size of India’s population, the number of jobs created could be significant. It would bring in foreign investment, as any foreign operator would, by law, be required to take on an Indian partner company as part of the licensing process. Standard rates of tax and a properly regulated gambling market would offer Indian gamblers a stable and protected market in which to gamble. Arguably, the most compelling reason for regulating online gambling, and gambling as a whole, in India is that ordinary Indians are doing it regardless. Indian gamblers are also increasingly betting on other sports such as soccer and Formula One racing. India faces a choice. Regulating online gambling would create jobs, bring in foreign investment, give Indian customers less incentive to go abroad to gamble, and open up a new source of tax income. To begin with, this may be worth as much as $1.5 billion, but could rise to as much as $4.6 billion – or more – in the years to come. Alternatively, it can continue to ignore these benefits, not only costing it tax revenue, but resulting in money going to companies outside of India, and leaving its citizens exposed to the perils of an unregulated market.